In his series of recordings for Vox in the 1950s Horenstein blended the familiar with the unfamiliar. In addition to Beethoven, Brahms, Mozart and Dvorak he made pioneering recordings of Mahler, Bruckner, Schoenberg and Stravinsky. The two works on this reissue fall into that category and in the case of the Shostakovich Fifth Symphony we have what must have been one of the first, if not the first, LP recording of the work. In 1952 the symphony was only fifteen years old, remember, so this could have been the first time admirers of this composer were able to hear this work at home without interruption when they wanted. And I do believe there is a special quality to early or first recordings. Unencumbered by routine and filled with zeal to do the right thing by a composer, they are often much fresher sounding than later efforts, analogous to newly painted canvases even though unfamiliarity might bring some insecurity in playing. In the first movement the overriding impression given by Horenstein is a refreshing need to press forward with the orchestra responding to a need to explore the score, almost as if they are aware of setting down a reference for others to follow. 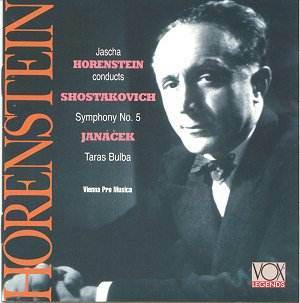 There is no attempt by Horenstein to weigh down the music with too much despondency which helps at the movement's central crisis where his unerring sense of the structure of the movement means he builds with the hand of a master engineer allied to edginess. The aftermath of this, though relatively consoling, doesn't give as much comfort as it can and in that accentuates an uneasy mood. In the second movement Mahlerian influences appear in Shostakovich's writing. He had attended Mahler performances by Horenstein in Russia around the time of writing this work that makes this recording a document of even greater interest. Interestingly, however, Horenstein seems careful to stress the Shostakovich quality to this movement. Notice how the well-balanced mono recording also catches just about everything from the growls of the lower brass to the harp and the string slides. Following this Horenstein reads the elegiac third movement "straight". What emerges is intensely moving for being quite cold. I also had a strong feeling, stronger than usual, that the central crisis of this third movement is a counterpart to that of the first. The passage immediately afterwards is "argued" by Horenstein, conveying a feeling that even he isn't yet quite sure how it should go. Again the impression coming over is that this early in the work's history interpreters are still feeling their way. By the end of the movement, however, an intimacy enters and I couldn't help but be reminded that this music emerged from a time when the Russian political climate was very harsh. Here it is being played against a background where the Cold War was at its most frozen in a city closer than most to the Iron Curtain. With Shostakovich you cannot escape these impressions. Horenstein's reading of the last movement is, by the nature of its recording date, utterly without overtones of trying to read what Shostakovich might have "really" been trying to say. The close therefore has a genuine nobility; an enhancing of the spirit whose meaning can be read in any number of ways. The early recording copes well with the demands the score makes on it with a well-balanced, honest sound picture of an orchestra anxious to give their best. The orchestra hiding behind the name "Vienna Pro Musica" on this disc is, by the way, the Vienna Symphony Orchestra. No less important or enjoyable is the recording of Janacek's Taras Bulba from 1955. The recording quality isn't quite as good as that for the Shostakovich in being closer and less atmospheric. Throughout the performance Horenstein is adept at seeming to tell a developing story. In fact the whole piece emerges with the fluency of a film soundtrack, changing from moment to moment. In the latter animated passage of The Death of Andriy there is a wonderful truculence to Horenstein's craggy sound palette that is then balanced by brilliance to the lyricism against which it is pitted. The Prophecy and Death builds to a grand climax with the final string peroration splendidly projected and within the texture rather than outside it. This is as distinguished a reading as that of the Shostakovich Symphony and is a very generous coupling for a work that usually appears alone.